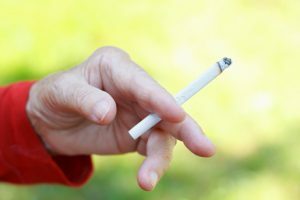 Is your elderly parent finally committed to kicking their smoking habit? As their caregiver, and partner with them on this journey, you can be instrumental in helping them quit smoking and improving their health. You are never too old to quit! Try these strategies to support your senior loved one and keep them motivated. Break from the Routine. Most smokers have a routine of times, places, and even social situations in which they smoke. Breaking this routine is important. If they typically smoked in front of the television, consider moving the furniture for a fresh outlook or relocate the table where they drink their first cup of coffee. Change the time of the day in which you eat or the restaurants that you typically would frequent. Consider going out to a movie or visiting friends to break them out of their routine and distract them from wanting a cigarette. Remove Obstacles. Eliminate the obstacles from the house that may make them relapse or remind them of smoking. Remove ashtrays, matches, lighters, cigarette cases, and of course, cigarettes. Thoroughly clean the house of anything that may have absorbed the smell of smoke–curtains, clothing, rugs, blankets, bedding, linens, and upholstery. Get Help. You do not have to go through this on your own. A person is much more likely to succeed at quitting smoking if they feel supported, so ask your family and friends for help. Consult with their physician to see if they can assist as they quit smoking with resources or medications. Look for support groups in your local community or visit SmokeFree60Plus, a website for older adults who want to quit smoking from the National Cancer Institute. Keep Them Motivated. Make positive signs and place encouraging notes around their home to remind your loved one of their goals. Share this good news with them: Your risk of heart attack decreases after three months of not smoking, and after one year, the risk of heart disease drops to that of a non-smoker! And as they successfully progress, celebrate and mark their milestones. Walk It Off. When the nicotine cravings hit, take a walk with them. Breathing in the clean air and getting some exercise will remind them of how less fatigued they are now. Distracting them from their craving and supporting them while they transition through this time is invaluable. Add Healthier Habits. Find ways that you can replace their smoking habit with healthier alternatives. Perhaps they would enjoy taking an exercise class like chair yoga or tai chi to experience their newly found energy. Meditation can be an excellent way to focus on healthy change and naturally calm your mind. Many people associate smoking with drinking alcohol, so limit their alcohol consumption. Remember It’s Tough. For someone who has been smoking for a long time, smoking is a part of their everyday life, and it may be difficult for them to let it go. Your loved one may be in a bad mood some days and find this extremely hard. Be loving and patient with them. Avoid losing your temper, scolding them, passing judgment, or any other detrimental behaviors that can hurt their feelings or damage their self-confidence.